I was pretty close on this one. In 2008, Ruiz played 117 games, hitting .219 with 4 HR and 31 RBI. His offensive numbers were clearly better. In 2009, 107 games, .255 average, 9 homers, and 43 RBI, 8 double plays. He also clearly improved on the number of double plays. With two more at-bats, he hit into 8 double plays, 6 less than the year before. The combo of Chris Coste and Paul Bako were much less productive than the year before, but the improvement of Ruiz essentially negates that. Overall, I would call the catcher position slightly better. I was very close on this one. Howard played all 162 games last season, batting .251 with 48 home runs, 146 RBI, 81 walks, and slugging percentage of .543, with 199 strikeouts. In 2009, in 160 games, he hit .279 with 45 homers and 141 RBI, 75 walks, and a .571 slugging percentage. As I predicted, he had very similar numbers with slightly less home runs, a slightly higher batting average, and less strikeouts. What I did not predict was his defense. Howard went from being a terrible fielder to a gold glove caliber fielder for the first half of 2009. His defense dropped off slightly since then, but he is so much better that I consider this season better. I expected a better season for Utley and even predicted an MVP trophy, but it did not happen. In 2008, he batted .292 with 33 HR and 104 RBI. Considering he was injured for a good portion of the season, I figured his stats would be much better, but his power numbers were less with one more month of games. This year, he batted .282 with 31 home runs and 93 RBI. I was way off on Jimmy Rollins. I thought he would rebound from an "off year" in 2008, but he was awful in the first half and had an overall bad offensive season. Rollins only played 137 games last season (with a month long injury) and batted .277 with 11 HR, 59 RBI, 76 runs scored, and 47 steals. In 2009, he played 155 games and batted .250 with 21 homers, 77 RBI, 100 runs scored, and 31 steals. But his defense remained the best in the business. That prediction is about right. In 133 games, Feliz batted .249 with 14 HR and 58 RBI and hit into 14 double plays. In 2009, he hit.266 with 11 HR and 82 RBI and 12 double plays. Greg Dobbs did not bat well and therefore did not play much and Feliz play many more games. Add the injury to the mix and Dobbs did not figure much in 2009. Comparing Ibanez with Pat Burrell, believe it or not the numbers are eerily close. Looking at their 2008 numbers, Burrell hit .250 with 33 HR, 86 RBI, 136 strikeouts, and 102 walks. In 2009 Ibanez hit .272 with 34 HR and 93 RBI, 119 strikeouts and 56 walks. Ibanez had a higher batting average and with slightly fewer strikeouts and significantly less walks. I was correct that the number would be similar in different ways, but I expected a consistent season from Ibanez that we never saw from Burrell. I couldn't be further off on that prediction. Ibanez was as inconsistent as they got with a terrific first half and horrific second half. Victorino batted .293 last season with 14 HR, 58 RBI, 102 runs, and 36 stolen bases in 146 games. In 2009 he hit .292 with 10 HR, 62 RBI, 102 runs, and 25 stolen bases in 156 games. I predicted a slight drop off, but his numbers were very, very, similar. I worried that last season might have been the best we could see from Victorino as he became more expose, but teams know Shane and he continues to produce. I could not have been any worse in this prediction. Jayson Werth went from a borderline everyday player to a true all-star in just one season. He had a good season in 2008 with 418 at-bats, hitting .273 with 24 home runs and 67 RBI. But he was still a relative unknown. Now that has changed and he got even better. This year, he hit .268 with 36 HR and 99 RBI. Jayson Werth is now a force in the lineup and hopefully someone we can count on for years to come. Who wouldn't have thought that Cole Hamels would have a career year? Cole started 33 games last year with a record of 14-10 and a 3.09 ERA in a Phillies record 227 1/3 innings, to go along with 196 strikeouts and 53 walks. And as ridiculous as he was in the postseason, it would stand to reason that this would be his year. It was not. In 2009, he went 10-11 with a 4.32 ERA in 193.2 innings with 168 strikeouts and 43 walks. He started out slow, and aside from a couple terrific outing, he never seemed to get it together. Obviously with the hip injury we will never know what would have happened with Brett Myers. What I can say is that when all of the other Phillies starters were awful, Brett was consistently average. He could have gone any direction, so who knows? If you compare Brett's spot to what we got from Cliff Lee, there is no comparison. All said, Cliff Lee went 7-4 with a 3.34 ERA with 3 complete games and one shutout. It's safe to say Lee is a better replacement than Myers. Unfortunately, I was correct about Jamie Moyer. After compiling a 3.71 ERA, with a 16-7 record in 196 1/3 innings a season ago, he was due to come back to Earth and he did. I said we should be happy if Moyer could stay near a 5.00 ERA and that is what he did, going 12-10 with a 4.94 ERA. You must give Moyer credit, though, because he did not want to pitch in the bullpen, yet did a fantastic job in that role. After a poor start to the season, Joe Blanton turned into the Phillies most consistent starting pitcher and he was really impressive. There is no comparison between Kyle Kendrick and Joe Blanton. Kendrick went 11-9 in 2008 with an ERA of 5.49. This season, big Joe pitched 31 games and had a 12-8 record with a 4.08 ERA and has really produced for us after coming over from Oakland. You probably forgot about Adam Eaton, who went 4-8 with a 5.80 ERA. Obviously we improved this year. Chan Ho Park began the year as the starter and was not good, but even with his struggles, Happ was so good this year that it was a major upgrade. Happ is a definite Rookie of the Year candidate, with a 12-4 record and a 2.93 ERA, to go along with 3 complete games and 2 shutouts. With a good head on his shoulders and certain positive arrogance about him, Happ has been the team MVP I believe. Last year's bullpen consisted mainly of Chad Durbin, Ryan Madson, Clay Condrey, J.C. Romero, Rudy Seanez, Scott Eyre, and Brad Lidge. 2009's squad was mainly Jamie Moyer, Chan Ho Park, Ryan Madson, Brett Myers, Chad Durbin, Brad Lidge, Tyler Walker, and Scott Eyre. Last year's bullpen was our biggest strength, but this year it is at the very least a question mark. Brad Lidge's problems are obvious. The numbers say enough. In 2008, Lidge was 2-0 with a 1.95 ERA and converted all 41 saves, pitching 69.1 innings with 50 hits, 35 walks, and 92 strikeouts. In 2009, he was 0-8 with a 7.91 ERA, blowing 11 out of 42 saves, pitching 58.2 innings with 72 hits, 34 walks, and 61 strikeouts. The rest of the bullpen was a mess due to injuries. Romero was out most of the season with a suspension and injury, and Scott Eyre, Chad Durbin, and Clay Condrey spent some time on the DL, as well. Nobody pitched particularly poor out of that group, and aside from Lidge, the bullpen was not a liability. Ryan Madson really came into his own this year. He had his struggles in the closer's role, and I think he has learned a lot from this experience and may be even better next year. The Phillies were and still remain the best defensive team in baseball. With Ibanez playing left and the dramatic improvement by Ryan Howard, we are even better this year. Record: 93-69 - EXACTLY RIGHT! Had you asked most baseball experts how Cliff Lee would perform in his first postseason appearance as the number 1 starter for the World Champions, they would have predicted a similar outcome. Yes, Cliff Lee has pitched poorly for nearly a month. But you just get the impression that Lee is not fazed by the pressure and he prepared himself for just such a situation. When asked if he was worried about hurting his arm by pitching so many innings, he said that he works hard in the offseason to prepare his body for a heavy workload and expects nothing else than to pitch nine innings each game. At a time where pitchers are babied from day 1, that is a refreshing thing to hear. In his game following his second consecutive poor outing in a loss to the Houston Astros that began with quite a few lucky bounces and weak hits that found holes, Lee was asked what happened. The typical answer would be that there a few bad breaks and that you need to fight through it. That would not be an excuse and would be a good way to look at it. But Lee didn't even mention the bad breaks. He simply said that he was throwing too many fastballs and he fell into a pattern that hitters picked up on. He said he needed to work in more of his other pitches to keep the batters unbalanced. Those two small examples show the type of player Cliff Lee is: a determined, hard working, focused individual with an insightful look at himself. Cliff Lee prepares hard for every single outing in exactly the same manner, knowing that "it is still 60 fee, 6 inches to the plate" and an outing in March is no different that one in October. It is that consistency that allowed Lee to come up big and I hope it continues until a parade down Broad Street. Charlie - doing what it takes or doing too much? To say Charlie Manuel's moves during Thursday's Game 2 loss to the Rockies was unorthodox would be an understatement. Charlie's decisions to allow Joe Blanton and JA Happ pitch in relief are major moves that could have a profound impact on the series and may force the Phils to go with Pedro Martinez in game 3. Let's take a moment to examine all of the moves. 1. Allowing Joe Blanton and JA Happ to pitch in relief. It certainly was a bit shocking to see two of the Phils probable Game 3 starters warming up in the bullpen in the sixth inning. Wouldn't you know, Charlie brought in both pitchers in the game. On the positive side, the moves show that Charlie answers to nobody and will make the decision he feels is best for the team. Some people might say he treated this game like it was game 7, but Charlie is sending the message that every game is a game 7 in his mind and he will not throw away any game. This game was important, and Charlie showed his faith in Blanton and Happ. On the negative side, why would you ask your starters to pitch in an uncomfortable role when you have guys who are paid to pitch in relief? Joe Blanton does is a guy who is built to give you innings and keep you in the game, not stop the bleeding right there. Besides, what does it do to the confidence of a Chad Durbin, knowing that he would rather pitch Blanton in a foreign role than bring Durbin in to a role he is paid for? 2. Making a double switch after the fifth inning. After pinch hitter for Hamels in the eighth inning, Charlie decided to do a double switch before the seventh inning, replacing Pedro Feliz with Miguel Cairo. It didn't seem to offer much of an advantage to make a change so early in the game. What it essentially did was replace Feliz with an inferior offensive and defensive player. It may not have made a difference defensively in the game, but Cairo had two at-bats that could have gone to Feliz., including an at-bat in the ninth. 3. Using Cliff Lee as a pinch runner. I don't think Charlie had much choice but to replace Matt Stairs with Cliff Lee. But if you are like me, you were probably picturing the scenario of Lee sliding into the plate and injuring himself. It more exposes the probably of a weak bench with no speed. The Philadelphia Phillies have one of the best, if not THE best defense in baseball. One of the reasons the '09 Phils are so fun to watch is that they catch the baseball and make the plays they are supposed to make. They don't come up with many fancy plays, but they make the routine ones, well, routine. But it was routine plays that cost the Phillies a 2-0 series lead over the Dodgers in the NLCS. And unfortunately they were all in one inning. Oh yes, the eighth inning. People can put the blame on Charlie Manuel for pulling Pedro Martinez or blame the bullpen for blowing the lead, but the fact is that none of those things would have been an issue if the fielders did their job. First batter: Casey Blake hit a hard bouncer to Pedro Feliz. The ball glanced off his glove and into left field. It is hard to place blame on Feliz for this since it had to be difficult to see in the shadows. But it was a play that had to made and wasn't. Second batter: Ronnie Belliard hit a bunt towards the mound. You can't blame Park because he just did not have time to get over. The problem on this play was Howard because it was a ball he could get to but he ran a bad route. It may seem nit picky, but he knew a bunt was coming and was not prepared. Like with the Scott Eyre play in the NLDS, Howard was a bit of a spectator and it cost them an out. Then the Utley play. I don't need to tell you how big a mistake that was. It was big. It was a bad play, but it was a mistake on a play he will make 99% of the time. Not much you can do about it. But those are three plays in one inning that could have been made. It is not fair to place a huge amount of blame on individuals. But it is something that good fielding teams like the Phillies can't do. It is simple: play better defense or lose the series. It's that simple. Everyone has their thoughts on who they feel will win the 2009 World Series between the Phillies and Yankees. Obviously the Yankees had the best record in baseball and the Phillies are reigning champs, but the best way to decide might be to compare the stats. I decided to compare the numbers for both teams and also come up with the numbers for the "typical" hitter and pitcher for each team. To begin, it is important to adjust as much as possible for the Designated Hitter. To do that, we first need to look at the runs scored in each league. For the 2009 regular season, the American League scored 4.88 runs per game and the National League scored 4.47 runs per game. According to those numbers, the AL scored 1.09 more runs per game. To adjust the numbers for the Phils and Yanks I used a very simple formula. 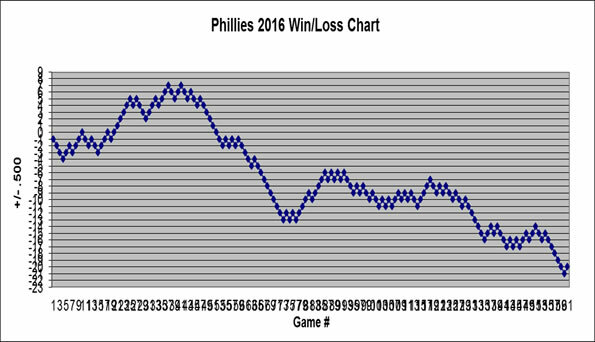 I just multiplied the runs scored by the Phillies by 1.09. This is certainly not a perfect adjustment because it ignores the fact that the AL is probably better and some of the games were interleague games, but it at least evens the playing field somewhat. The Yankees have an advantage in both categories, but the Phillies are pretty close. I decided to take the numbers of each of the everyday hitters on each team, come up with the average numbers between them, and adjust based on a 162 game season. This gives us the numbers for the "typical" player on each team. Since hitters are not specifically affected by the DH, there was no need to adjust for it. Average Yankees hitter: .291 average with 28 home runs, 97 RBI, and 9 stolen bases. Average Phillies hitter: .271 average with 27 home runs, 94 RBI, and 16 steals. Overall, the Yankees have a better average, slightly better power, and fewer stolen bases. To compare pitching, it seemed futile to compare the bullpens because there are so many "x-factors," so I decided to just compare the starters. Since the fourth starter for each team is unclear, we will simply compare the top three starters on each team. Here are the average ERA's for each team. Now that we have all of the numbers I can give you a clear prediction on the result of this series and who will hold the trophy for 2009. My prediction: I HAVE NO CLUE. After looking, comparing, and analyzing all of these numbers, we pretty much know what we did before, that this should be a very close series. Other than that, we will just need to watch the games!